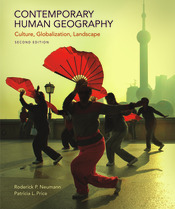 With each chapter organized by five themes (region, mobility, globalization, nature-culture, cultural landscape), Contemporary Human Geography introduces students to geography concepts through fascinating topics such as the distribution of college sports, the relationship of beauty pageants and cultural identity, texting and language modification, and more, continually reinforcing geographers’ contributions to our understanding of how we live in a globalized, modern world. The authors frame this coverage using specific learning objectives to help students focus on essential concepts and prepare for class discussions, assignments, and exams. Contemporary Human Geography comes with two of Macmillan’s online course spaces, allowing instructors to choose how much media and assessment they’d like to make available for their students, and at what price point. SaplingPlus offers innovative media content, curated assessments, and brand new mapping activities powered by Esri. Achieve Read & Practice combines the accessibility of a VitalSource e-book with our self-paced, formative quizzing engine, LearningCurve.